Hey party people! 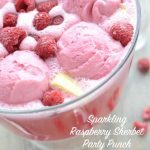 The next time you host a party, you’ve got to wow your friends with this sparkling raspberry sherbet party punch. It’s like the sherbet punch you grew up with, only kicked up a notch with added fresh fruit and a tart lime twist. The colors of this punch just make me so happy. We served it in a big trifle bowl and it was so pretty up on a pedestal. This punch can come together in minutes right before your guests arrive, with a few steps done the night before. 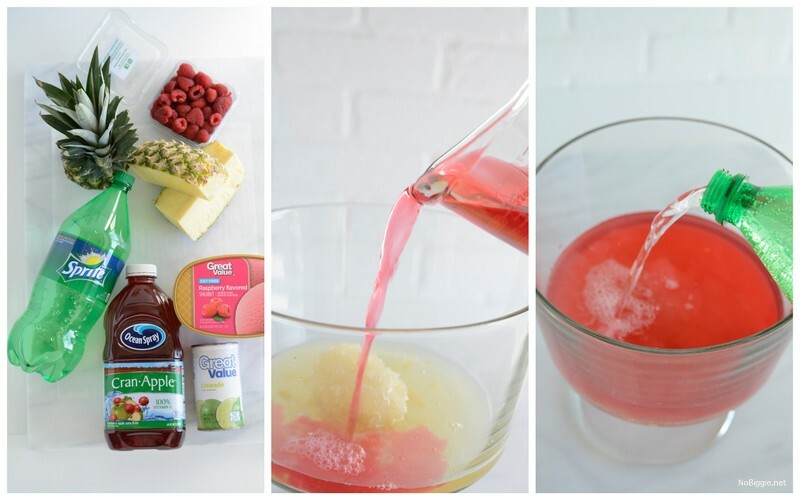 The first party punch we shared: The BEST party punch ever (!) will always be a favorite around here, so don’t miss that recipe if you love small pebble ice. The BEST ICE EVER! Here’s the ingredient lineup. 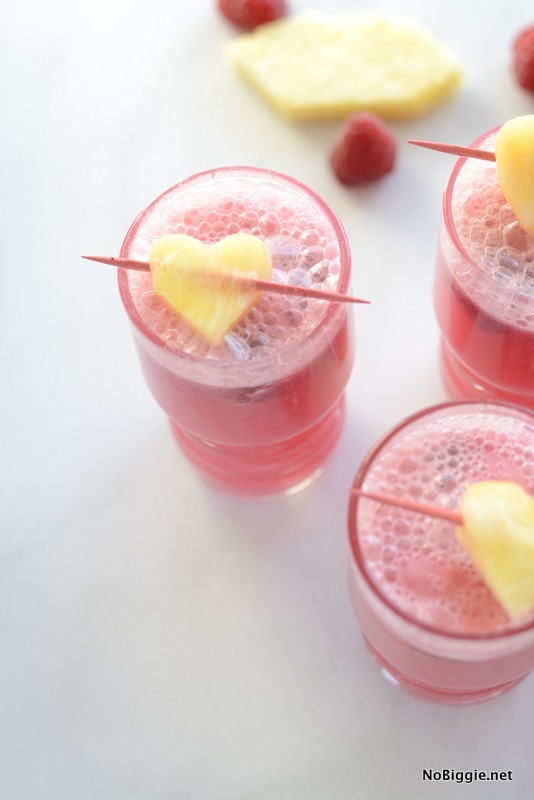 You can use fresh or frozen raspberries, as well as fresh pineapple or canned pineapple. 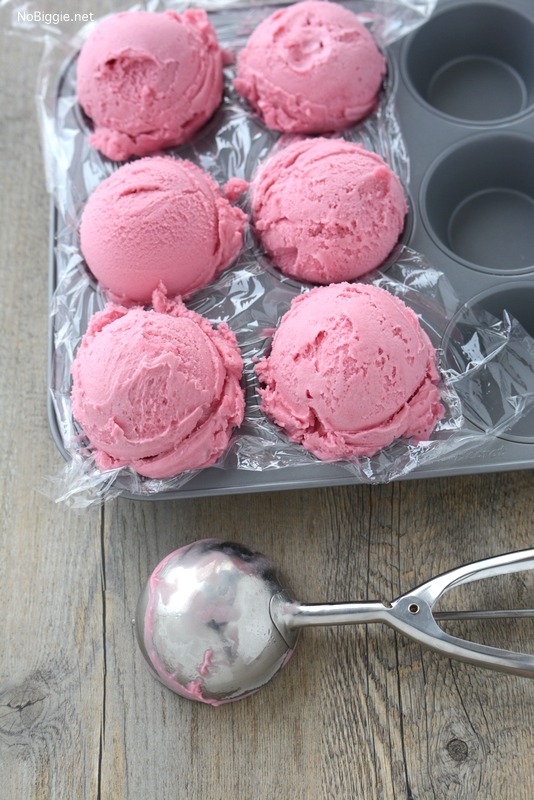 Quick Tip: pre scoop and freeze the raspberry sherbet the night before you assemble the punch. This will help the sherbet melt slower in the punch, and it will also give you one less thing to do on the day of your party. Love this giant ice cream scoop for the job! 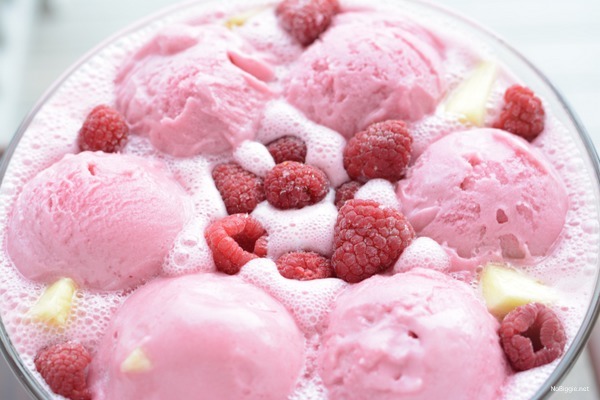 The frozen raspberries help chill the punch as well. 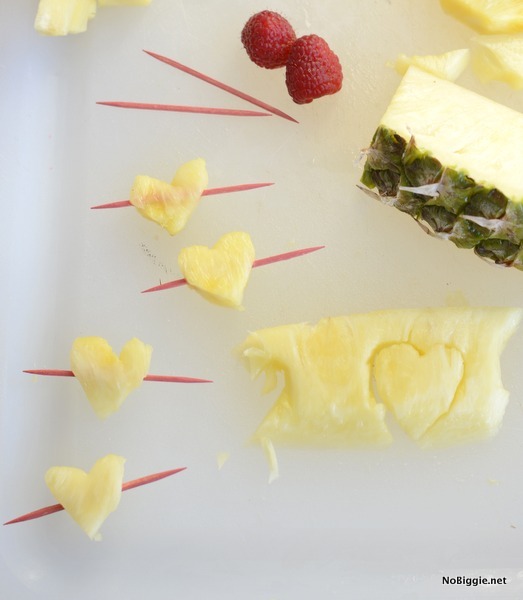 Here’s a cute garnish idea: tiny pineapple hearts on tooth picks. With just a sharp pairing knife, you can make little heart shapes. This would be cute for a bridal shower or baby shower. It would also be adorable for a Valentine’s Day party. 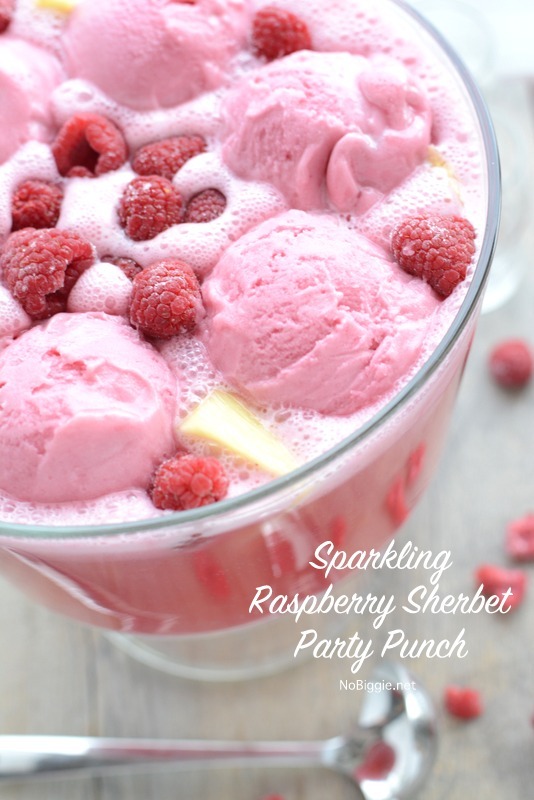 Serve up this delicious Sparkling Raspberry Sherbet Party Punch at your next get together. Hours before serving (or the night before), pre-scoop 6 to 8 big scoops of the raspberry sherbet and freeze on a plastic wrap lined muffin pan. Add these on top of your punch right before serving. Dump the can of limeade concentrate into your serving bowl, followed by half of the cran-apple juice and about 1/3 of the Sprite. Stir these three liquids together until combined. 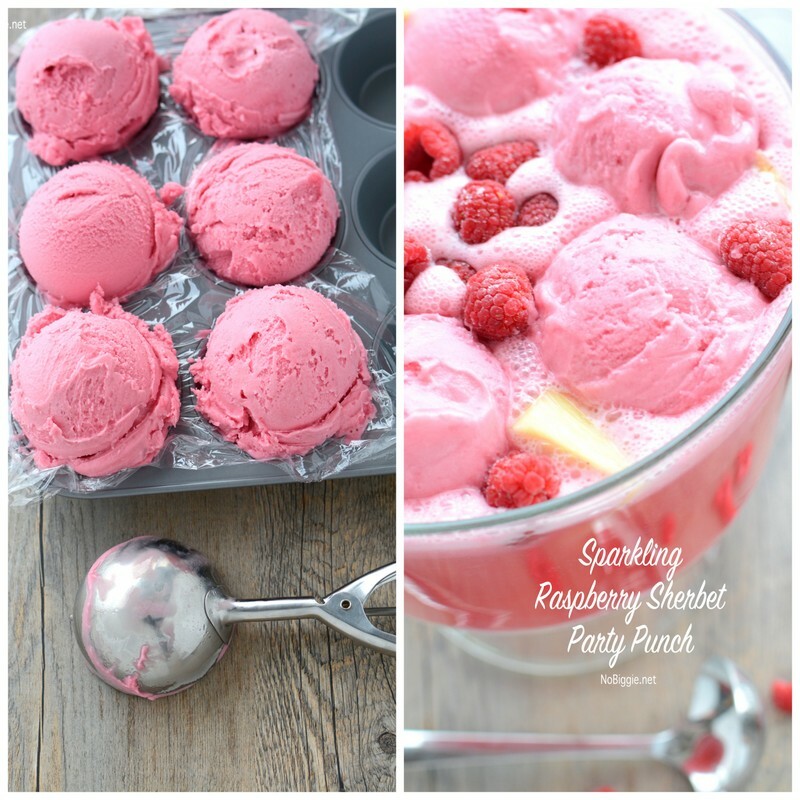 Place the sherbet scoops on top and garnish with the raspberries and pineapple. Add in more Sprite for extra bubbles at the top and serve! If you'd like to dilute the limeade before adding it into the punch, you can make the limeade as directed on the can.